If you need more help, feel free to private message noungning our wiki mod or darvil one of our admin. 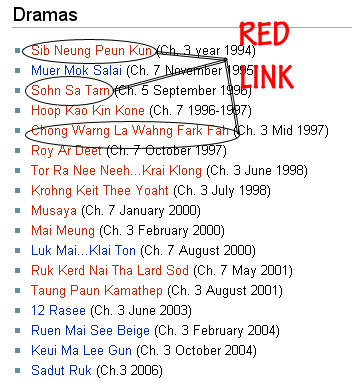 When you see an object with red font this means the page doesn't exist in our wiki, and it needs to be made. If the font is blue or purple, it means it has a page and is "linked" or is connected to another page. 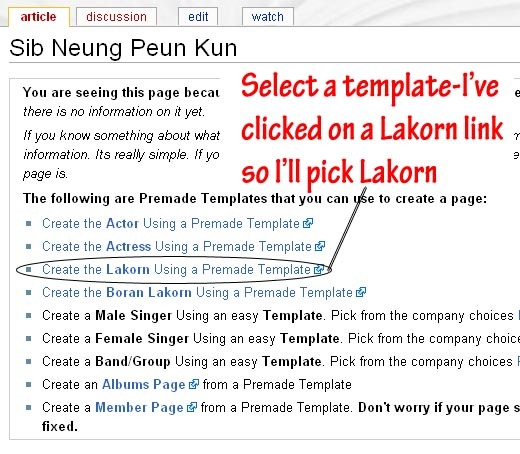 Click on the type of template you would like to use, in my example, I clicked a Lakorn, so I will use the "Lakorn Template"
Then you will be in the template, with the name of the Lakorn which you've clicked. Once you click save, you will be shown with the page you've just created. Now you can click edit and edit the info, and don't forget to click save! With these, you can make anything, however you have to go into the area where you'd like to make the page, and create the person. Very easy, however, if there are duplications i.e. you make something that already exists with the same name, spelled the same exact way, it will just bring you to that page. But due to various spellings of the item you want to make, you might end up making a duplication of something that already exist but is spelled differently. Please check for the item you want to create before you create them. First, click on the category where you want to create this item. I'll create a Male Actor in this example. 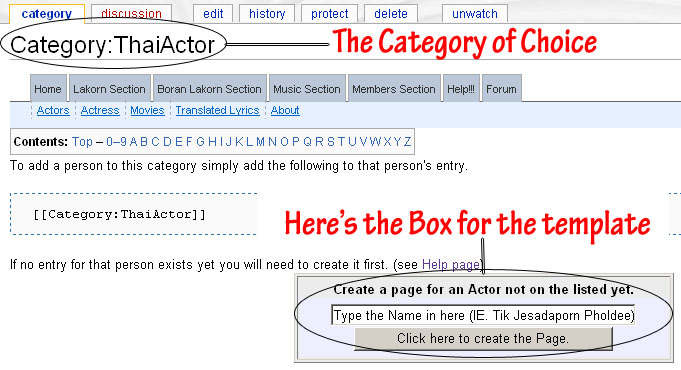 In the box, type in the Actor you'd like to add, after you've searched and have not found this person in the list. 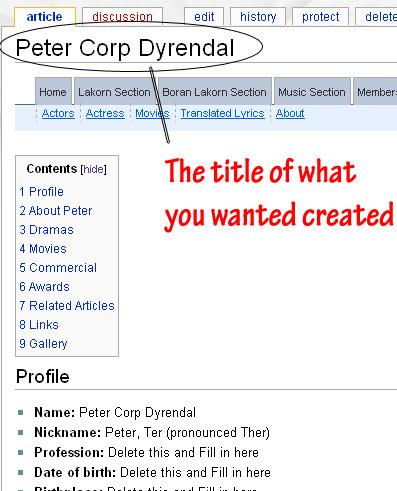 Please use this format for the name Nickname Realname Lastname, I'll do a page for Peter Corp Dyrendal since that doesn't exist. This is very easy to do. First off, selet the page you want to edit. 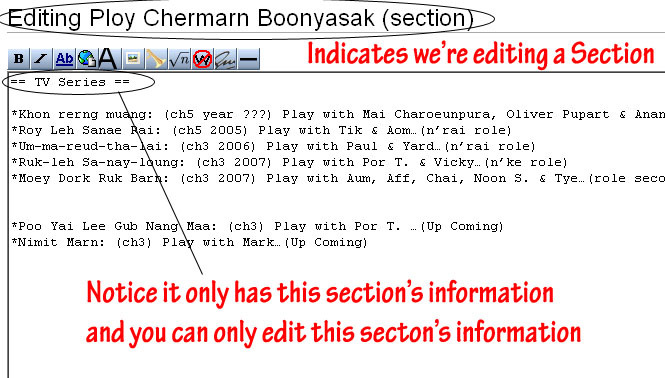 In this case, I'm working on the actress section so I've selected Ploy Chermarn Booyasak. Click on Edit to edit the entire profile. When you are in the edit area, you will see that you can edit the whole entire page from this edit. Edit the page with the information you'd like to input. Then when you're done, don't forget to click save. This is easier for those who just wants to edit a particular section, so you don't have to scroll through so much information to get to a specific section, you can just go to that section you want to edit and click on the edit to the top right hand side of the section. So if you would like to edit profile section, click on the edit to the immediate right of that heading to edit the information below the section. 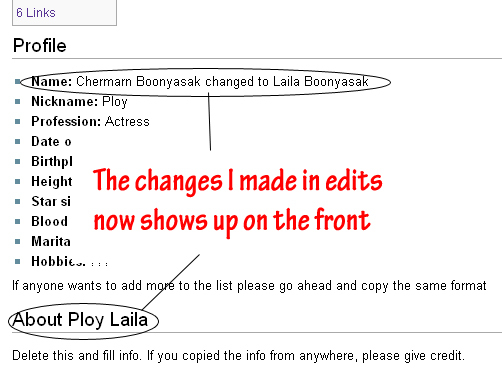 In this example I clicked on the edit for TV Series, so we will be going into edit her lakorn information. Now, just change whatever information you'd like and click save. 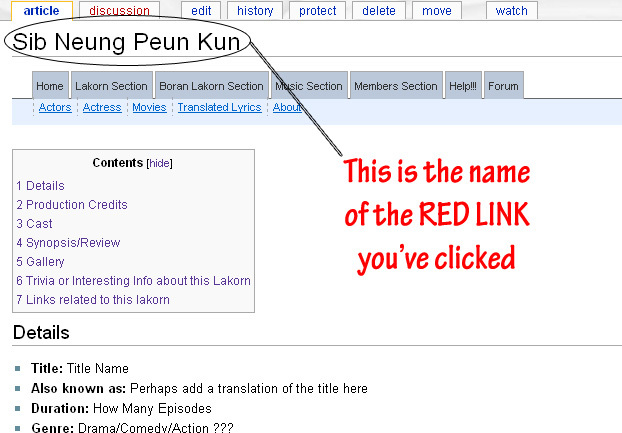 Notice from various pages you've looked at, there are pages that link to another wiki page. And if there isn't a page that it can link to, it's red, and if it's able to link to another page, it's either blue or purple. 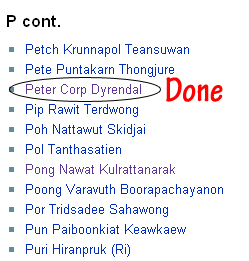 Notice in the edits, what I've done, I placed [[ ]] at the beginning and ending of the Lakorns. 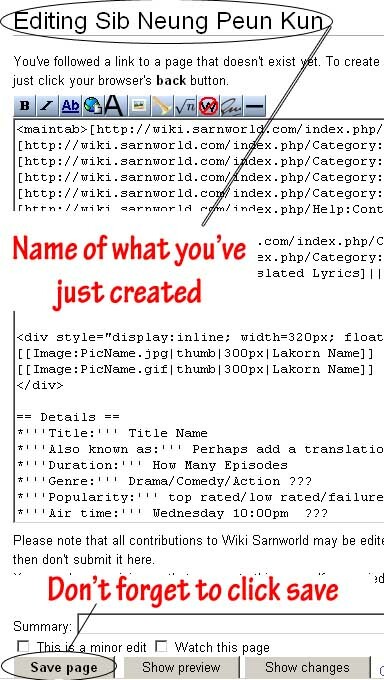 This will link it to any page that has the same exact name as what is between the [[ ]]. For the best results, search for what you want to link the page to, then copy and paste the title of the page of the profile in between the brackets so you know for sure that the page exists and is spelled correctly. Many pages are created and can be spelled differently, so you should always search first for the page so it will link to a page that may exist with a different spelling. I am currently trying to go through all the pages and link them, but this is a very long and tideous task, I will not be able to catch up on all but don't worry, I will try my best to go through and link them. 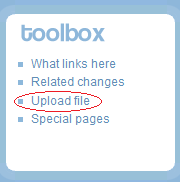 Click on the upload file link under the toolbox. This is located on the left hand side. 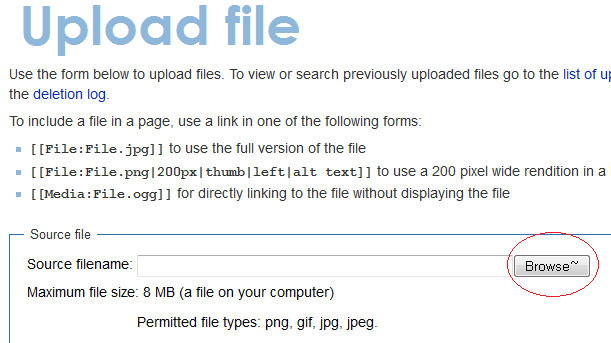 The Upload Link page will show, click on browse. Browse to the file you would like, open it. DO NOT change destination filename unless there's a duplicate name, only change the beginning of the name and not the extension of the name (the period) or else it will error. 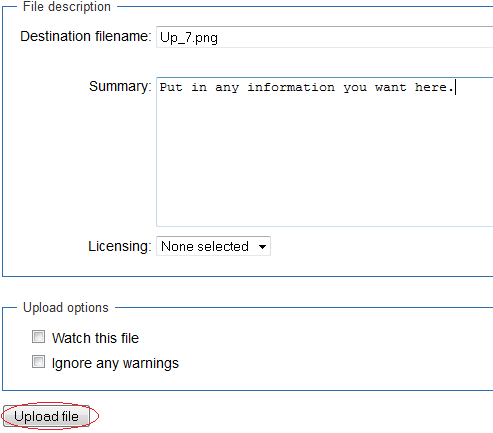 Update the summary as you'd like, then click on Upload File. Remember the name you used as seen in this photo here. Now find the page where you want to put in the picture. Here, I picked a random page. But let's say I decided this is the page where I want to add more pictures. Read this to mean: Image:NameofImage.jpg, show as thumbnail, pixel size, name of image you want people to read under the image. Just make a copy of one of the current photos, add to the bottom, add to the top, and edit the part that is after image: or file: or media:. To add images to a gallery is more simpler! Remember that name of the picture! Go to the gallery section of the page, click edit and add the photo name. 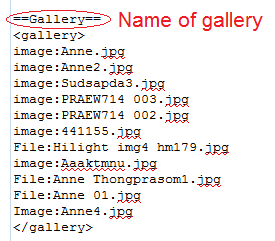 Just make sure that they are between the <gallery> </gallery> codes. Make sure you use 4 of them, you don't need to type your name after those characters. 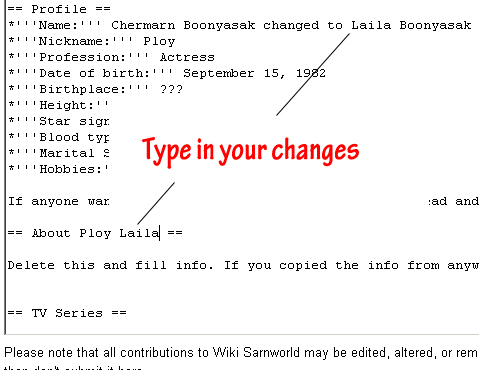 Wiki will detect who you are and put your name and the current time and date. The time will be the server time and not your actual time. 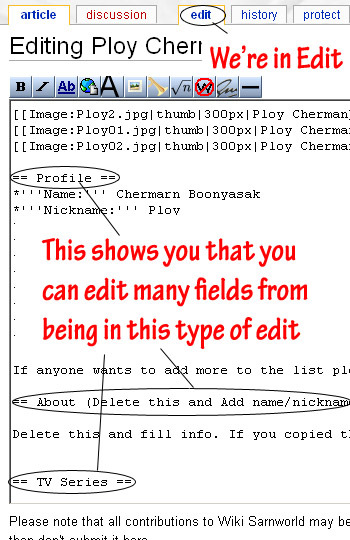 Hope this helps and now you can put your name after your edits. It's not necessary since we can see who edited pages on page history, but this will be a nice thing to have if you've written a biography of someone, wrote a small article, or gave a lakorn a brief synopsis. This page was last modified on 5 January 2013, at 03:54.